Inder Loves Folk Art: Coming Soon: Shorts on the Line! Coming Soon: Shorts on the Line! Well, things are definitely slowing down a bit on the sewing front over here. I'm almost 35 weeks pregnant now, and I'm getting pretty big and uncomfortable. My back is pretty achy after a day at work, so spending my evenings cutting things out on the floor, standing at my ironing board, and sitting at the sewing machine is not as appealing as it was a month ago. But I do have a couple projects in the works, and one of them is pretty exciting! 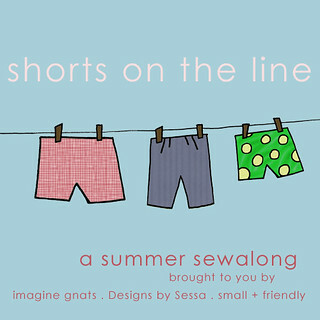 Rachael of Imagine Gnats, Carla of small + friendly, and Vanessa of Designs by Sessa invited me to participate in their upcoming sew-along, Shorts on the Line. For the first couple weeks of July, they will be featuring guest posts (including my very first guest post ever, people!) with shorts inspirations, tutorials, and pattern reviews. My post goes up on July 3, tee hee! You all know how I enjoy sewing shorts for my little guy! I've only sewn about a billion pairs, but he always needs more. I have an idea I'm pretty excited about (hint: I'm going to try using contrasting lime green thread on black chambray). So now I just need to get to work! Check out the Flickr group and the Pinterest board. Boring Blog Administration Note: I've decided to turn off word verification in my comments. It's getting harder and harder to read Blogger's word verification, and I'm getting sick of squinting at it on the blogs I love to comment on, so I figured y'all were probably tired of it too. It also makes it much harder to comment from a mobile device. So let's see how this goes. If the spam becomes overwhelming, I'll switch it back. So far, I have not been inundated with spam, so I'm feeling hopeful that I can bid the word verification goodbye for good! Hooray! I can't wait to see what you make and I'm so glad you are guest posting! P.S.- Thank you so much for ditching the word codes, now I can comment more without cursing as much! I've been trying to get a little work done on my project every day in the morning, while I'm still feeling peppy (and not too achy). I'm excited! P.S. Boring blog updates remind me, I haven't been able to figure out how to subscribe to comments on your blog, so that I can get email updates, like I usually do on other blogs. Is there a trick I'm missing? But I have this vivid image in my mind of sturdy British schoolboys in shorts and knee socks on frigid days, with knees that are red and raw from the cold!! He he, I suppose that is true. It didn't happen at my school though, I think it's limited to the private schools, to toughen them up. Weekend Miscellany & Late June Garden Ramble. Ruched Maternity Tee, Take Two.